Munich, Germany, – April 17, 2012 - Bruker Corporation (NASDAQ: BRKR) reports at the Analytica 2012 their successful launch of the fully automated stand-alone FTIR microscope LUMOS. The LUMOS is designed to combine best performance for visible inspection and infrared spectral analysis with highest user comfort. Due to the motorization and networking of all moveable components inside the LUMOS, the system provides a high degree of automation. The intuitive software of the LUMOS guides the operator step-by-step through the process of data acquisition. At each step the user interface only provides these functions appropriate to proceed. A major innovation is certainly the motorization of the ATR crystal in the objective. Due to this feature all IR measurements, even those in ATR mode, are performed fully automated with the LUMOS. The LUMOS includes a 8x-objective which is used for measurements in transmission, reflection and ATR. In transmission and reflection the ATR crystal is inserted into the objective. For data acquisition in ATR the crystal is positioned into the IR focus by an encoded piezo drive. An integrated pressure control ensures the constancy of the pressure applied from the crystal to the sample which is essential for mapping and imaging experiments. Three different pressure steps can be software-selected in order to achieve highest performance for all types of samples ranging from very soft to very hard. Although the LUMOS is designed to be operated by non-experts for routine applications, its exceptional sensitivity makes it also suitable for highly demanding applications. 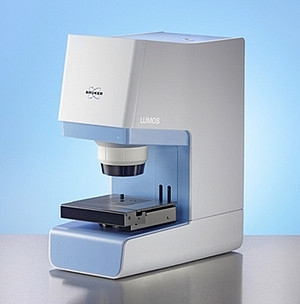 The LUMOS complements Bruker’s existing FTIR miscroscope product line, consisting of the HYPERION series, which offers everything needed for highly advanced applications in R&D. The HYPERION 2000 provide an unsurpassed sensitivity in FTIR-microscopy at highest spatial resolution, whereas the HYPERION 3000 is the guiding instrument for FTIR imaging using modern focal plane array technology.